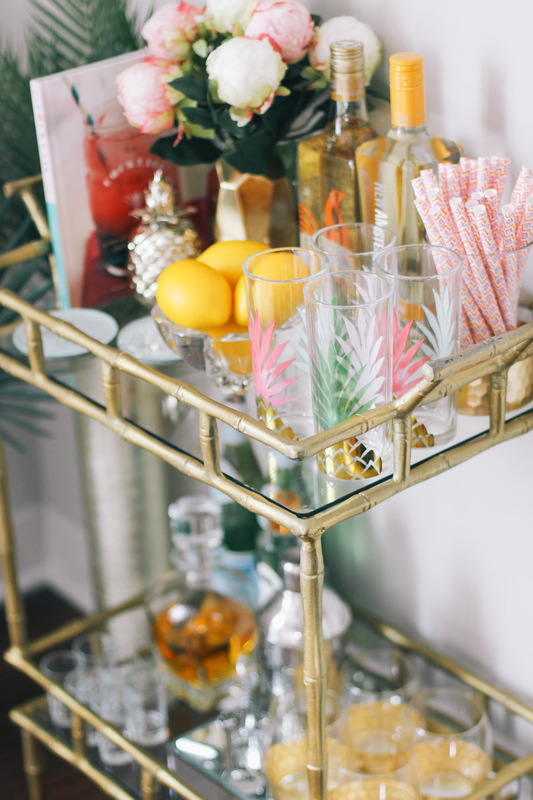 A loaded bar cart is a must for summer! Love these coasters. Bottoms up! How cute are these pineapple glasses? I love these gold foil glasses and they were only $20! With summer just around the corner, there’s very little that I crave more than margaritas with my girlfriends. I love entertaining and always have so much fun hosting girl’s nights. The other night I had two of my very best friends, Haleigh and Gretchen, over for guac and margs and it just made me so excited for summertime!!! They are both home for the next few months (YAY!) until they move (insert crying emoji) but I'm definitely looking forward to making some fun summer memories. 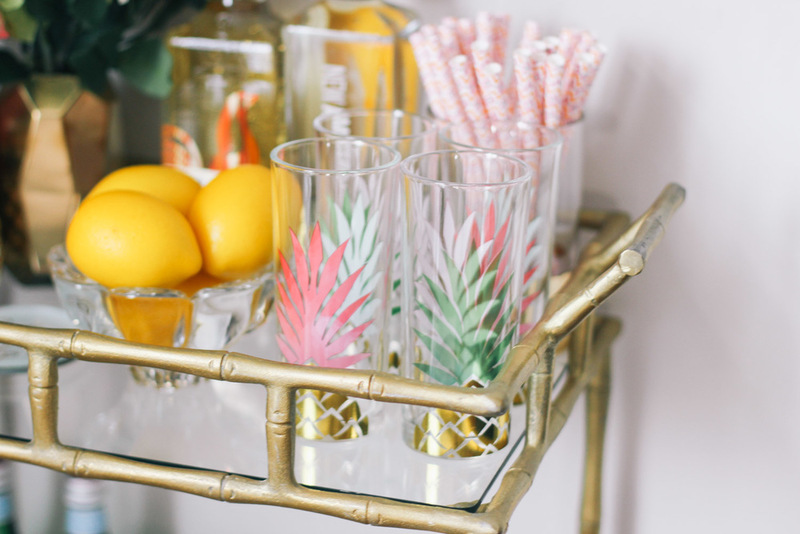 I'm so excited about today's post because I’ve partnered with At Home to show you how I styled my bar cart for summer. I actually heard about At Home from two of my good friends, Vanessa and Ellie, and they both told me on separate occasions that I had to check it out. There is one close to where I live in Indianapolis so I wanted to go see what this was all about. I went with my friend Vanessa I was kind of blown away by the huge assortment of decorating/entertaining items at such low prices. They literally have every department you can imagine and I’m pretty sure I just walked down aisle after aisle overwhelmed by everything I wanted to buy. Okay anyways, back to the bar cart. It was kind of crazy how much I could get to load my bar cart from At Home because everything was at a low price. 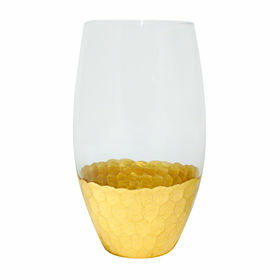 The gold foil wine glasses were like $12.99! I love decorating with gold accents but I also wanted to make sure I added some pops of color for summer. I saw the adorable pineapple highball glasses right when I walked in the door and I was like, I have to have those. I added some bright lemons for a pop of color and cute gold coasters with the words "party", "cheers" and "bottoms up!". I’ve linked everything on my bar cart from At Home below. 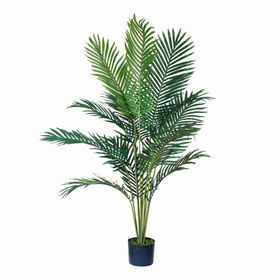 Visit At Home's website for more home decor inspiration and visit your local At Home store for great deals on an amazing selection of home decorations. *This post was sponsored by At Home. As always, all opinions are my own. Thank you for supporting the companies that support Lemon Blonde!